Zebra Pen Corporation partners with US Department of Education and others in support of nationwide early learning initiative to provide children with a life-long enjoyment of learning. The right start leads to success in life. Zebra Pen Corporation has partnered with USA Today on an initiative to support early childhood education. Early childhood experiences have a deep impact on the rest of a child’s life, and America’s future economic prosperity will ultimately be determined by the success of today’s children. This initiative aims to supply parents, teachers and children with the resources and education to provide children with equal opportunities, so that more of America’s children are prepared to succeed in the 21st century. Zebra is a participant in the Early Childhood Education campaign insert appearing in USA Today March 25 - 27. “Zebra Pen proudly supports early learning goals to build a solid educational foundation for our children and our future,” said Ken Newman, Director of Marketing at Zebra Pen Corporation. Research shows that children acquire a working knowledge of the alphabetic system through both reading and writing. Moreover, they experience joy and a sense of accomplishment from reading and writing while mastering basic concepts – a strong predictor of achievement. 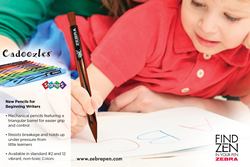 Zebra helps beginning writers by providing easy-to-hold pencils designed for little hands. Pencils with playful patterns and colored lead make learning to write fun and encourage creative expression. Zebra Pen is dedicated to providing products for the developing, aspiring and achieving stages of educational development from preschool through college and beyond. Zebra continues to build relationships in education with associations and many educational programs that reflect that vision. Zebra Pen developed an educational resource with Association of Zoos and Aquariums (AZA) that teaches conservation. This resource for teachers includes downloadable lesson plans and activities for ages K-12 grades (http://www.learnwithzoos.com). Zebra Pen has also been a long time supporter of The Kids in Need Foundation’s mission is to ensure that every child is prepared to learn and succeed by providing free school supplies nationally to students most in need (http://www.kinf.org). Zebra Pen Corporation was founded in New York in August 1982 as an independent corporation wholly owned by Zebra Co., Ltd., of Tokyo, Japan. A New Jersey-based writing instrument manufacturer, Zebra Pen Corporation’s mission is to distribute products that are of the highest quality, providing value to customers and meeting their overall writing needs with a wide variety of writing instruments. Zebra Pen Corporation offers a full line of writing instruments, including ballpoint pens, gel pens, roller ball pens, mechanical pencils, and highlighters. Today, with over 100 years of excellence behind them, Zebra Pen Corporation is leading the way with a wide range of quality writing products including the Steel®, Sarasa®, Z-Grip® and Cadoozles® brands. For more information, visit http://www.ZebraPen.com.